Waviness tends to be generated on cut surfaces even when an ultraprecision milling machine with a single-crystal diamond tool is used. The present study deals with the reduction of waviness by controlling the feeding mechanisms of the milling machine. A machining experiment on a spherical surface of a mirror element in a mirror array showed that the machined surface exhibited periodic waviness with a height of 30 nm and a wavelength of 300 μm. To investigate the reason for such waviness, a slope was machined under simultaneous multiaxis motion control of the feeding mechanisms of the milling machine. 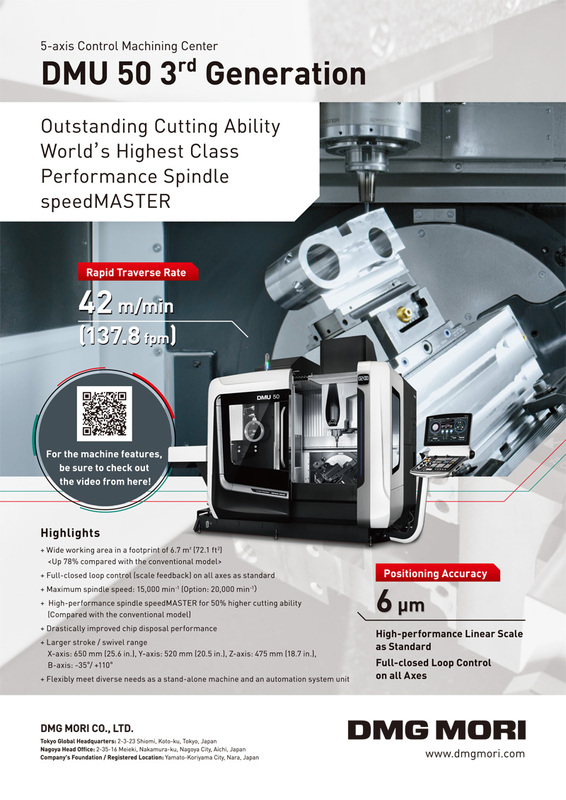 This proved that the interpolation errors of the encoders used in the milling machine produce the waviness on the machined surface when machining is carried out under simultaneous multiaxis motion control. To reduce such interpolation errors, the positioning accuracy of the machine stages was measured using a laser interferometer. On the basis of the measured results, the feeding mechanisms were compensated such that the positioning errors including the interpolation errors were corrected. Using the machine with the compensated feeding system, a mirror element was shaped. Consequently, waviness was reduced and the surface smoothness was less than 10 nm, demonstrating that such compensation can produce superior optical surfaces. Full text (1.4MB) (free) Please log in. H. Takino and Y. Takeuchi, “Machining of Smooth Optical Surfaces by Ultraprecision Milling with Compensated Feeding Mechanisms,” Int. J. Automation Technol., Vol.13, No.2, pp. 185-190, 2019. T. T. Saito, “Machining of optics: an introduction,” Appl. Opt., Vol.14, No.8, pp. 1773-1776, 1975. J. E. Sollid, R. E. Sladky, W. H. Reichelt, and S. Singer, “Single-point diamond-turned copper mirrors: figure evaluation,” Appl. Opt., Vol.15, No.7, pp. 1656-1658, 1976. C. G. Blough, M. Rossi, S. K. Mack, and R. L. Michaels, “Single-point diamond turning and replication of visible and near-infrared diffractive optical elements,” Appl. Opt., Vol.36, No,20, pp. 4648-4654, 1997. M. B. Fleming and M. C. Hutley, “Blazed diffractive optics,” Appl. Opt., Vol.36, No.20, pp. 4635-4643, 1997. Y. Takeuchi, O. Miyagawa, T. Kawai, and K. Sawada, “Non-adhesive Direct Bonding of Tiny Parts by Means of Ultraprecision Trapezoid Microgrooves,” J. of Micro system Technologies, Vol.7, No.1, pp. 6-10, 2001. Y. Takeuchi, S. Maeda, T. Kawai, and K. Sawada, “Manufacture of Multiple-focus Micro Fresnel Lenses by Means of Nonrotational Diamond Grooving,” Annals of the CIRP, Vol.51, No.1, pp. 343-346, 2002. Y. Takeuchi, H. Yonekura, and K. Sawada, “Creation of 3-D Tiny Statue by 5-Axis Control Ultraprecision Machining,” Computer-Aided Design, Vol.35, No.4, pp. 403-409, 2003. Y. Hashimoto, Y. Takeuchi, T. Kawai, K. Sawada, H. Takino, and K. Nomura, “Ultraprecision 5-axis Control Machining of Fly-Eye Mirror in EUV Lithography,” JSME Int. J., Vol.47, No.3, pp. 916-924, 2004. A. Y. Yi and L. Li, “Design and fabrication of a microlens array by use of a slow tool servo,” Opt. Lett., Vol.30, pp. 1707-1709, 2005. J. Schaefer, “Single Point Diamond Turning: Progress in Precision,” Int. Optical Design Conf. 2006, Vancouver, Canada, Technical Digest (CD) (Optical Society of America), paper ThB1, 2006. Y. Takeuchi, H. Suzukawa, T. Kawai, and Y. Sakaida, “Creation of Ultra-Precision Microstructures with High Aspect Ratios,” Annals of the CIRP, Vol.55, No.1, pp. 107-110, 2006. H. Takino, T. Kawai, and Y. Takeuchi, “5-Axis Control Ultra-precision Machining of Complex-Shaped Mirrors for Extreme Ultraviolet Lithography System,” Annals of the CIRP, Vol.56, No.1, pp. 123-126, 2007. M. Warren, “Diamond-Turned Optics Manufacturing and Precision Mechanical Metrology,” Optics and Photonics News, Vol.19, No.3, pp. 18-21, 2008. H. Takino, T. Oba, and Y. Takeuchi, “Fabrication of spherical microlens array mold by ultra-precision multiaxis-control milling,” Proc. 13th Int. Conf. of European Society of Precision Engineering and Nanotechnology (euspen), Vol.II, pp. 101-104, 2013. Z. Zhu and S. To, “Adaptive tool servo diamond turning for enhancing machining efficiency and surface quality of freeform optics,” Opt. Exp., Vol.23, No.16, pp. 20234-20248, 2015. H. Suzuki, M. Okada, K. Okada, and Y. Ito, “Precision Cutting of Ceramics with Milling Tool of Single Crystalline Diamond,” Int. J. Automation Technol., Vol.9, No.1, pp. 26-32, 2015. S. Baba, K. Nakamoto, and Y. Takeuchi, “Multi-Axis Control Ultraprecision Machining Based on Tool Setting Errors Compensation,” Int. J. Automation Technol., Vol.10, No.1, pp. 114-120, 2016. C. Huang and R. Liang, “Modeling of surface topography on diamond-turned spherical and freeform surfaces,” Appl. Opt., Vol.56, No.15, pp. 4466-4473, 2017. Y. Li, H. Takino, and F. Frost, “Ion beam planarization of diamond turned surfaces with various roughness profiles,” Opt. Exp., Vol.25, No.7, pp. 7828-7838, 2017. K. Nakamoto and Y. Takeuchi, “Recent Advances in Multiaxis Control and Multitasking Machining,” Int. J. Automation Technol., Vol.11, No.2, pp. 140-154, 2017. W. C. Sweatt, “High-Efficiency Condenser Design for Illuminating a Ring Field,” OSA Proc. on Soft X-ray Projection Lithography, Vol.18, pp. 70-72, 1993. J. B. Murphy, D. L. White, A. A. McDowell, and O. R. Wood II, “Synchrotron Radiation Sources and Condensers for Projection X-ray Lithography,” Appl. Opt., Vol.32, pp. 6920-6929, 1993. H. N. Chapman and K. A. Nugent, “A Novel Condenser for EUV Lithography Ring-Field Projection Optics,” Proc. SPIE, Vol.3767, pp. 225-236, 1999. H. Komatsuda, “Novel Illumination System for EUVL,” Proc. SPIE, Vol.3997, pp. 765-776, 2000. H. Takino, “High-precision fabrication of optical elements,” Proc. 10th Int. Machine Tool Engineers Conf. (IMEC), pp. 188-198, 2002. H. Takino, T. Kobayashi, N. Shibata, M. Kuki, A. Itoh, and H. Komatsuda, “Fabrication of a complex-shaped mirror for an extreme ultraviolet lithography illumination system,” Optical Engineering, Vol.42, No.9, pp. 2676-268, 2003. H. Takino, M. Kuki, A. Itoh, H. Komatsuda, K. Nomura, and N. Shibata, “Fabrication of a complex-shaped mirror by arranging silicon mirror elements,” J. Microlithography, Microfabrication, and Microsystems, Vol.3, No.3, pp. 396-401, 2004. H. Takino, M. Kanaoka, and K. Nomura, “Ultraprecision Machining of Optical Surfaces,” Proc. Int. Symp. on Ultraprecision Engineering and Nanotechnology (ISUPEN), pp. 5-10, 2011. K. Murakami, T. Oshino, H. Kondo, H. Chiba, Y. Kawabe, T. Ono, N. Kandaka, A. Yamazaki, T. Yamaguchi, R. Shibata, and M. Shiraishi, “Development of EUV lithography tool technologies at Nikon,” Proc. SPIE, Vol.8322, p. 35, 2012.